Schistosomiasis, or bilharzia, is a common parasitic disease which can cause bladder dysfunction and hematuria, and even correlate with bladder cancer and increase HIV susceptibility with urogenital lesions. Globally, it is estimated that more than 240 million people are infected. Within endemic areas, children carry the heaviest burden of infection. Its treatment depends intensively on PZQ, which has replaced other antischistosomal drugs and become a regular first-line therapy. However, given that PZQ has been widely used for almost 40 years, the emergence of schistosomal resistance under drug selection pressure has received much attention. With the increase in schistosomiasis, the serious threat of PZQ resistance requires adequate monitoring of current mass drug administration programs. Thus, novel alternative interventions are in high demand, and in this study, we use hyperthermia to prevent and treat heat-sensitive schistosomiasis. High temperature has been used to treat illnesses dating back to as early as 5000 years ago. Magnetic hyperthermia is a new clinical therapy approved for treatment of tumor cells . Hyperthermia treatment can shrink tumors via the selective killing of cancer cells by damaging proteins and cellular structures. Recently, similar successful therapies have also been reported in treating acne vulgaris, mild-to-moderate inflammatory acne and cutaneous leishmaniasis. 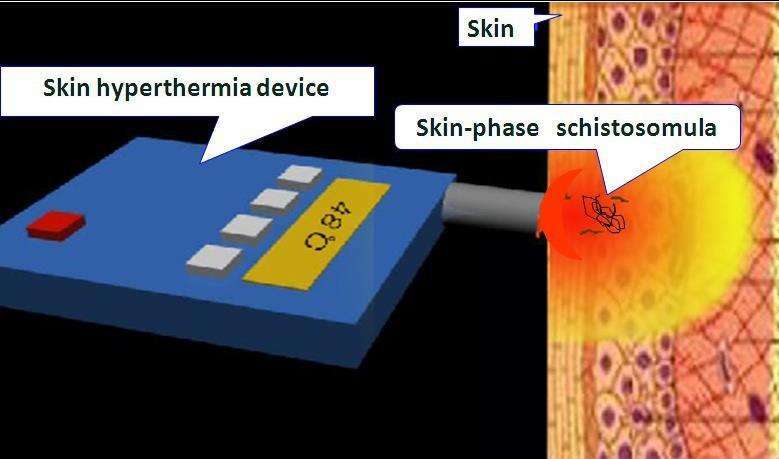 A skin-hyperthermia device (Figure 1) designed by Tsinghua university was used to target migrating skin schistosomula and to expand on the in vitro pre-treatment findings on cercariae, which is a novel method for treating the skin phase of a parasite infection. The data revealed that with increased thermal dosages, the survival rate of cercariae decreased from 70 percent to 0 percent, which indicated the preventing effect of hyperthermia (P < 0.05). When treated with thermal dosages above 45°C, the survival rate of cercariae ranged from a 50 percent reduction to almost 100 percent compared with control groups. Moreover, when the S. japonicum infected mice were treated by heating the cercarial-contact region of skin, the worm reduction rates (WRR) reached 83.1 percent (P < 0.05). The sensitivity of adult schistosomes to heat was also investigated with a microwave hyperthermia device (Figure 2A). The WRR, hepatic shift rates and egg reduction rates were 23.7 percent, 40 percent and 30 percent respectively after treatment with thermal dosages of 42~43 °C for 20 minutes. Although it failed to exceed the group of PZQ, the results suggest that hyperthermia could be an effective prevention method.